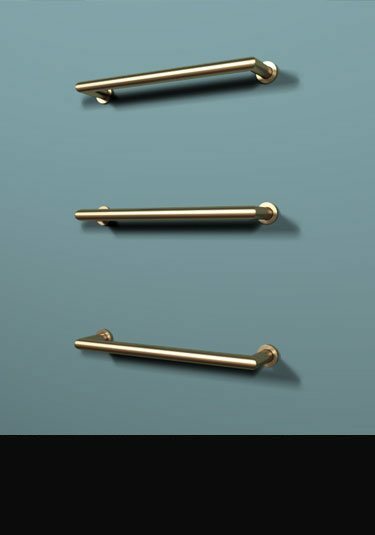 Brass finished taps was the original material of choice within the bathing area before plated finishes became commercially available. 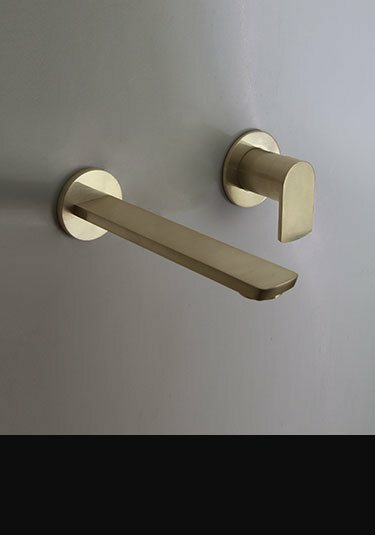 In recent years the demand for the brass finish within the bathroom has become increasingly popular in exclusive and luxury interior design especially in more modern and contemporary styles. 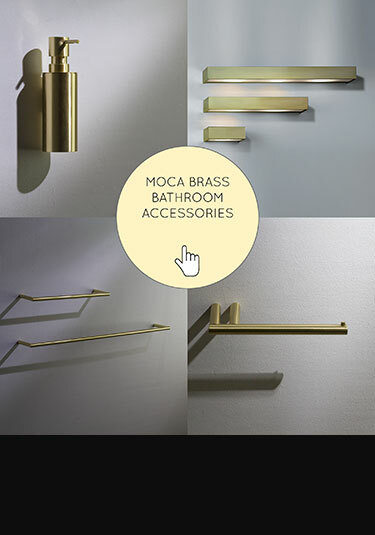 Because of this demand Livinghouse launched the Moca collection which used the latest modern look but made in a traditional brass finish. 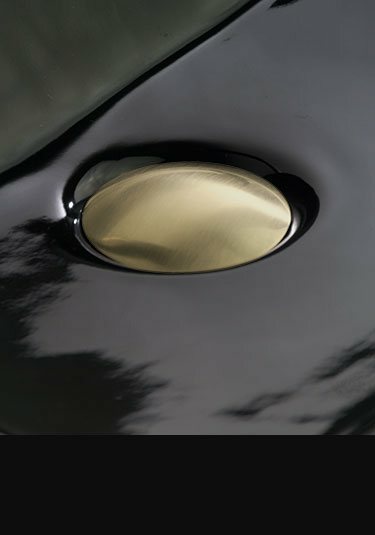 We decided to offer it in a lacquer protected finish for easier maintenance and because of the demand, in a natural unfinished brass which tarnishes gradually when exposed to the air but produces a popular mellow patina, this patina can be hand polished if preferred if it becomes too dull. We offer a full collection of brass taps including basin and bath taps in mixer, wall mounted, deck mounted and freestanding designs and to match we offer a full range of shower fittings including shower heads in handheld, fixed, douche and ceiling styles and shower valves that are manual and thermostatic controlled, for recessed in wall installation and supplied with 1 way and 2 way multi-functions. We also offer those often missing finishing touch including wall outlet elbow, basin bottle traps and bath and basin wastes. This collection is styled and the UK and made in Europe ensuring beautiful styling and lovely quality. The collection is covered by a manufactures guarantee of 5 years on the natural finish and 2 years on the lacquer protected version. This modern styled brass basin tap is a stylish and contemporary addition for any bathroom sink. With a single lever handle this mixer tap has a lightly brushed brass finish which can be supplied in either lacquered or unlacquered finish. 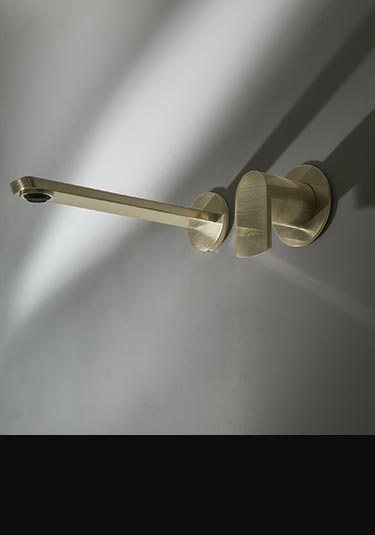 Impressive brushed brass wall mounted tap designed for stylish basins and sinks. Supplied in the latest modern styling this wall basin tap is available with lacquer protection or in natural brass for periodic polishing or can be left to build up a natural brass patina. This stylish contemporary bath mixer tap with matching wall spout is finished with lacquer protection for easy maintenance or unfinished for periodic polishing. Unique bathroom tap finish making a lovely design feature within designer and exclusive styled bathrooms. 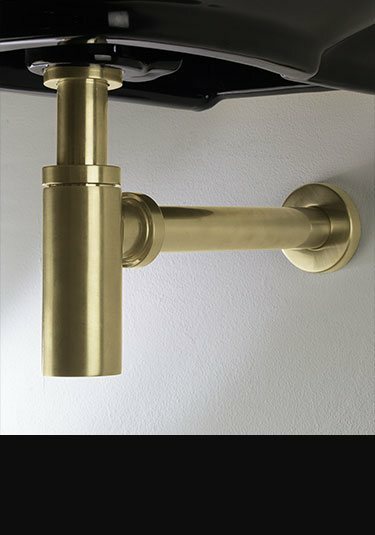 Stylish brushed brass freestanding bath filler tap with handy handheld shower attachment available with lacquer protection or unfinished brass which requires polishing as part its maintenance. Each floor standing tap is Italian manufactured and styled in the UK. 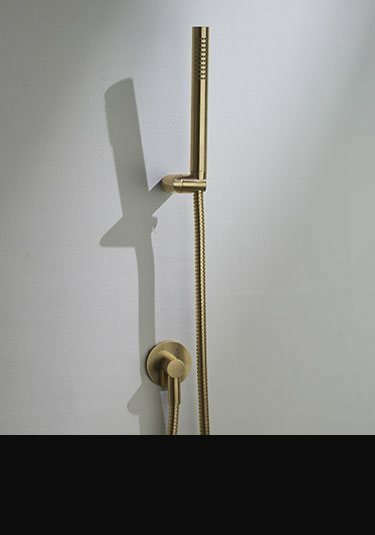 A designer shower head in a beautiful brushed brass finish in lacquer or unfinished unprotected brass and is available in 200mm and 300mm diameters. Beautiful European styling. 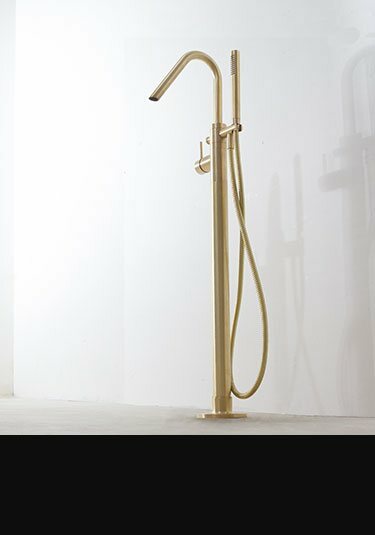 Finish in an exclusive brushed brass finish this adjustable slide rail shower with contemporary styled handheld shower head make a beautiful design theme within high quality bathroom design. 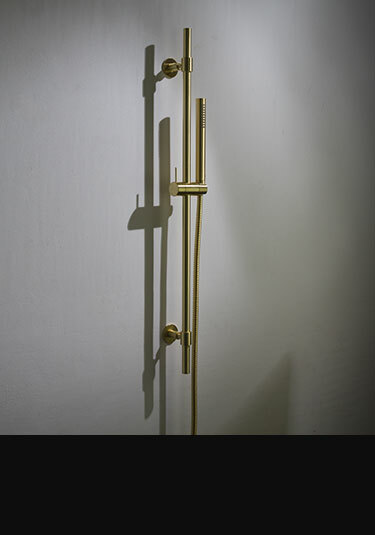 Available in both protected or natural unfinished brass and European manufactured. 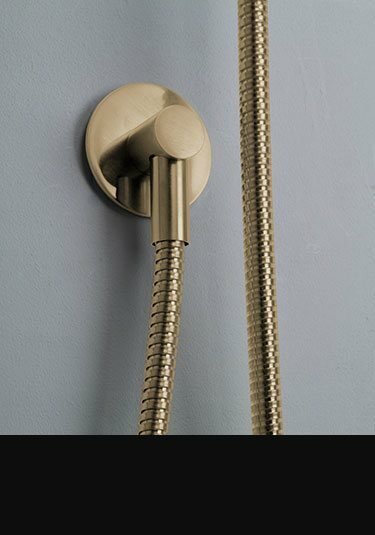 A thermostatic shower valve in a brushed brass finish which can be lacquer protected for easy maintenance or supplied in an unfinished brass allowing a natural patina to evolve or for periodic polishing. 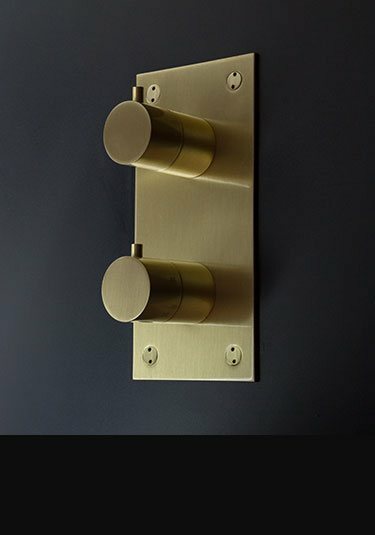 This brass shower control is supplied as a single function valve or with 2 way multi-functions. 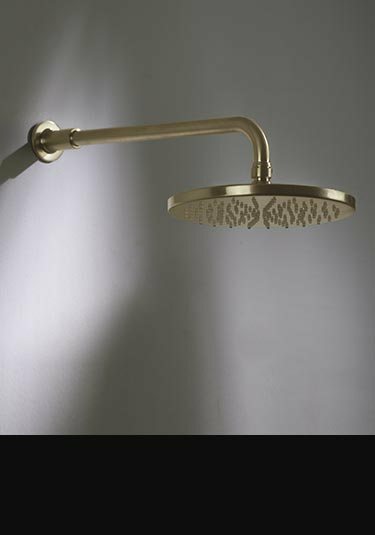 An exclusive brushed brass handheld shower head designed for wall mounting on a fixed holder. This douche style shower head is supplied in lacquered protected brass of for the traditionalist it can be supplied unfinished allowing for a tarnishing patina to be achieved or periodic polishing if preferred. Simply styled and ideal for modern bathroom design this single lever shower valve is designed for the pipework to be recessed into the wall. 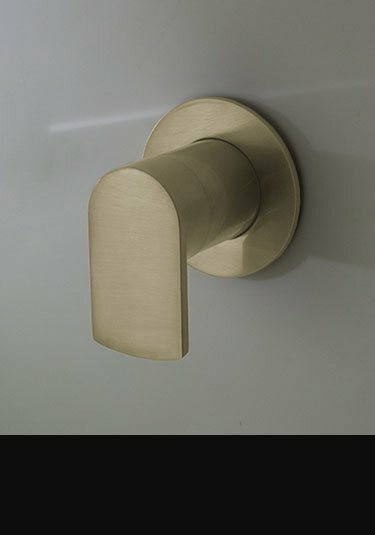 Finished in brushed brass which can unfinished for natural tarnishing and polishing or we also offer the shower control with clear lacquer protection if preferred. Supplied in a unique brushed brass finish this shower wall elbow allows for contemporary and tidy installation of flexible shower hoses. 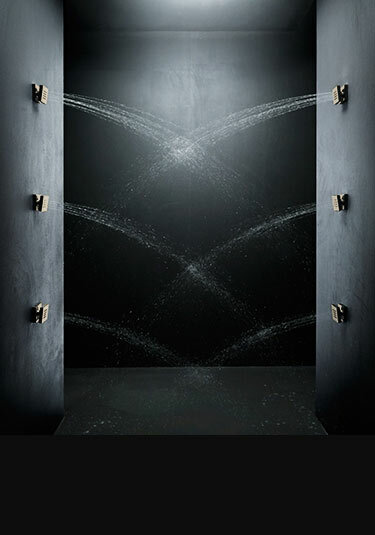 This shower wall outlet is part of a matching & exclusive bathroom taps collection. This exclusive brass finished bottle trap is supplied with lacquered protection or in a unfinished brushed brass allowing natural tarnishing and polishing. 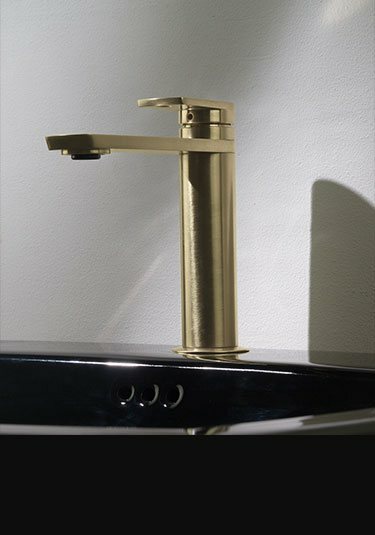 This luxury finishing touch for wall mounted basins and sinks is part of a full range of brass bathroom taps and shower fittings. An exclusive brushed brass basin waste with a click clap push opening and closing mechanism. This sink plughole waste is part of a full range of matching brass taps available with lacquer protection or unfinished for natural tarnishing and polishing. 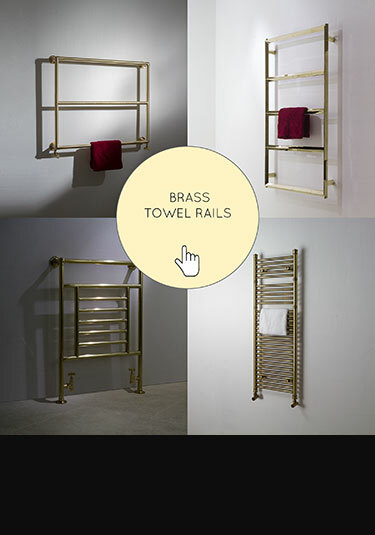 With its independent heated towel bars, this brushed brass towel radiator gives the impression of individual floating hangers. In reality each towel bar is connected to an in-wall built in manifold which is connected to the central heating system. This brushed brass bath waste is a perfect addition to a brass bathroom colour scheme. 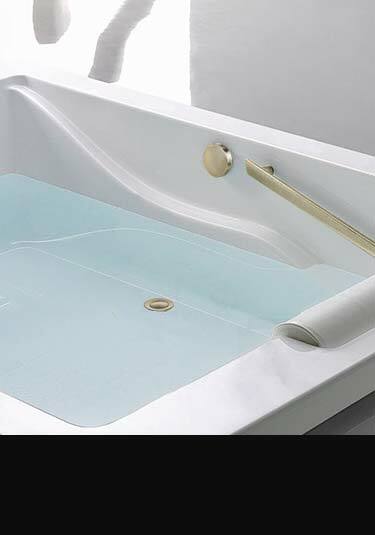 This brass pop-up bath waste includes the matching overflow cover. To complete a stainless steel themed bathroom after the selection of taps and bathroom accessories is to have matching heat source. Livinghouse can supply heated towel radiators and towel bar radiators in polished and brushed finishes varies traditional and contemporary styles.